Boxty is one of Ireland's famous potato dishes. Here, it's paired with bacon & honey for a breakfast dish not unlike those the Americans serve up. Use the best quality bacon you can. Put 250g unpeeled potatoes in a pan of cold water, bring to the boil and cook for 20 minutes until soft. Drain the potatoes, scoop out the flesh, mash it and cool. Discard the skins. Meanwhile, peel and grate the remaining raw potatoes and place in a bowl with the flour and bicarbonate of soda. Add the cooled mash, then add just enough buttermilk to make a very thick batter. Season really well. Preheat the oven to 140°C, gas mark 1. Heat a griddle or non-stick frying pan, grease it well with the butter, then drop in a quarter of the mix to make three 7cm pancakes. Cook the pancakes over a medium heat for 2 minutes, reduce the heat to low and cook for 3 minutes more. Once you can see bubbles on the surface of the pancakes, flip over and slowly cook for 4–5 minutes on the other side until golden. Keep warm in the oven and repeat, cooking the remaining pancake mix in three batches. You may need to re-grease the pan each time. 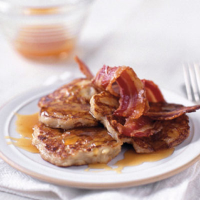 Grill or fry the bacon and serve each person 3 pancakes with bacon and a drizzle of honey.